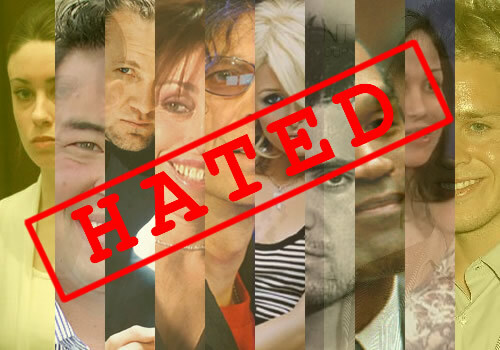 MOST HATED 10 PEOPLE IN THE U.S B.S? Well lets go through the list of the most hated people in the u.s that was released today by e poll market research? 1 Casey Anthony – The exploiting HLN news made millions of dollars off ratings off her and her familys unfortunates personal tragedy? 2 Reality TV star Spencer Pratt from MTV’s “The Hills I don’t know about him or really care about spencer’s situation? 3 Nadya “Octomom” Suleman- at least reality tv is supporting her big family instead of the tax payers? 5-6 Jon Gosselin and his ex-wife Kate GosselinI don’t mine Kated? I could care less of jon? 7 Levi Johnston, father of Sarah Palin’s grandson – I think people should focus on the whole palin family on that one? 8 Paris Hilton- I don’t mine here cause I don’t follow her situation maybe? 9 Heidi Fleiss – she’s been out of the spot lime light for years? 10 Howard Stern – WTF I like him so does millions of his radio tv listeners? In a other article Jesse James is in somewhere in the most hated people in america for sleazing around on Sandra Bullock? I don’t blame him for her dumb mate picking decisions? I think tabloid news in america is like a mafia run industry and its controlled by big corporations cnn hln is the most untrusted news in my opinion.